Sun Peaks ski resort is interior British Columbia’s largest destination ski resort. Locals and visitors choose Sun Peaks Resort for it’s award-winning downhill skiing, snowboarding and cross country skiing in the winter. Summer activities at Sun Peaks Resort include hiking, golfing and downhill mountain biking. Sun Peaks Resort is also a great place to try something new like stand up paddle-surfing on Heffley Lake or ride a Sno-Limo during the winter if skiing or boarding isn’t your thing. 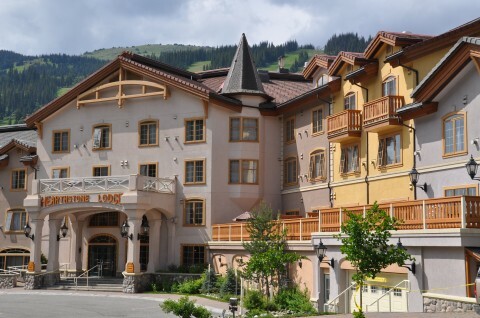 Sun Peaks Resort’s European-style village is nestled at the base of three mountains. The village layout makes it very easy to skate-ski from the Hearthstone Lodge doors to the Sundance Chair. You can also peruse the shops and art galleries and also take in the excellent on-mountain restaurants, pubs and cafes. We highly recommend visiting Mountain High Pizza, Sun Peaks Bakery and Tod Mountain Coffee House and Creperie when you are visiting Sun Peaks, BC. Our Sun Peaks Ski Resort hotel is very easy to get to by plane, train, bus or automobile. Centrally located in the BC interior, Sun Peaks Resort is 4 hours from Vancouver, BC, or 7 hours from Prince George, BC and only 3 hours from Kelowna, BC. Our neighbouring city of Kamloops is a hub for 3 major highways – Trans Canada, Coquihalla Highway #5 and the Cariboo Highway #97. Daily direct flights through Kamloops Airport and Kelowna Airport with connections to cities across North America, Europe, Australia and Asia make getting to Sun Peaks, BC seamless. Airport shuttle service is available from Kamloops, Kelowna and Vancouver. The BC interior is known for its light, dry, “easy-to-ski” snow. Sun Peaks is protected from the mild, coastal weather caused by the Coastal Mountains. Prevailing storms come from the Pacific Ocean and rise and cool as they pass over the Coast Mountains before reaching Sun Peaks. This results is reliable snow conditions and is a big reason why Sun Peaks has such a great snow reputation. The second largest skiable area in British Columbia and third largest in Canada with 3,678 skiable acres of terrain, 882 metres of vertical, 124 runs, including 12 designated glad areas. This is not only to be enjoyed in the winter but in the summer time this terrain converts to some of the best mountain biking in BC. Sun Peaks’ three mountains circle the village in a unique 360 degree layout. This makes it extremely convenient to cruise down to your hotel room at the Hearthstone Lodge for a break, snack or meet up with family and friends. Everything is within a short walking distance for dining, activities and chair lifts. The Sundance Kids Centre offers child minding services and of course, ski school is available for children to learn how to ski. At Sun Peaks Resort there is also an aquatic centre, bungee trampoline, ice skating, tube park and year round activities for kids. Stay at the Hearthstone Lodge and enjoy the convenience of being amidst it all. Sun Peaks offers over 20 restaurants. A short walk around the village and you’re sure to enjoy the great shopping, sports equipment rentals, art galleries and even a grocery store for goodies to cook in your suite.